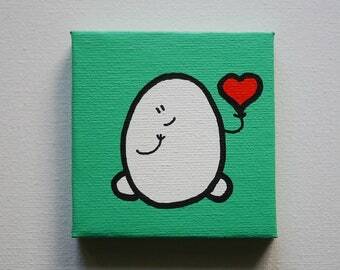 Cute Art to make your walls happy. Check http://www.etsy.com/people/Tekzuki for my previous artwork & clothing. 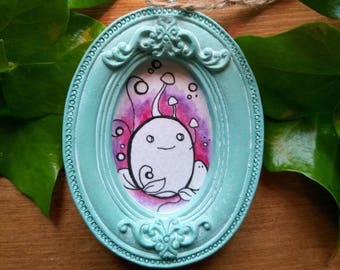 Tiny red framed painting. Miniature Chep - Born to be Different. Miniature Chep Pink and Purple Watercolour Oval painting in a Shabby Chic Vintage Style Frame. Ready to hang. Miniature Chep Blue Watercolour Oval painting in a Vintage Style Frame. Ready to hang. 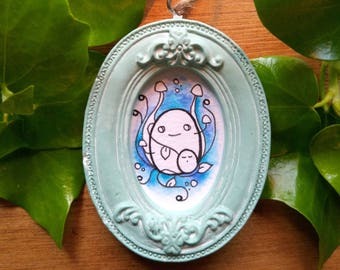 Chep Miniature Painting Woodslice - Magnet or Badge - You decide! Excellent mini wooden easels - just what I wanted, thank you. A collection of some of my wooden pieces that I have created. My Pink Girl woodcut. Cut on my scroll saw & then painted & varnished. My Bear woodcut. He ponders great things... Cut on my scroll saw & then painted & varnished. Set of Chep Russian dolls. 'Showcase', Richmix, Bethnal Green Rd, London. 'Other Side Of The Wall Graffiti Exhibition', London. I have sold to Australia, many countries throughout Europe, and almost every state in the USA and will continue to do more exhibitions later in the year as well as some pieces outside & on the streets, so keep your eyes peeled for some Cheps! The name Chep started out as my nickname, and means anything cute &/or small. Thanks for stopping by & welcome to the world of Chep!! Here is my virtual corner of the world where you will find my art work. I love to create art with a happy, positive & pretty silly vibe to it, so if you've got a sense of humour, like to grin alot & don't take life too seriously then I hope you will find something you like here! In the future I hope to do abit more graphic based stuff aswell to give a mix to the shop. My clothing label & other shop here on Etsy is Tekzuki & is winding down now, so once those t-shirts have gone that's it! So if you want to grab yourself a t-shirt that will soon be a rarity then do it. All artwork & designs are my own, copyrighted & owned by me. If items are lost by the postal services we will work together to get to the bottom of it. I ALWAYS keep a receipt & record of the item leaving here. I dread this scenario as I work so hard on my artwork I'd hate for it to get lost. However once it leaves here it's in the hands of the postal people & I can provide copies of receipts. If you required a tracked service let me know & I will let you know the price. To be issued with a refund or exchange you would need to return the item postmarked within 30 days. Goods being returned by the buyer must be in the original condition. If you wish for an exchange as long as the items are in stock thats fine, out of stock items would receive a refund. Refunds would be minus the shipping charges & shipping for items sent back would need to be covered by the buyer. My primary method of payment is Paypal but if you need to pay by cheque or postal order I will do my best to accomodate you. If you don't have a Paypal account you can still use it to pay via your card or just sign up it's dead easy. I ship all items wherever they are destined to go within 48 hours of payment being received, I always try to get stuff out within a day though, so you can get your Chep goodie sooner rather than later. Although this may differ slightly for a custom order. If there's ever a delay for some bizarre reason i'll let you know. I try to keep my shipping prices as fair as poss so it just covers my packaging costs & getting the goods to you. Also where possible I try to recycle packaging materials. The paintings come very securely packed in bubble wrap & then boxed in cardboard & wrapped again. If you have any questions at all feel free to convo me! I am also very happy to carry out commissions/custom work.